“The essence of good food is in the cooking” This adage is very true especially when the food is tasty and well cooked. Cooking is actually very simple. However many people are afraid to cook only because they think that they cant cook. CoOking becomes simple and easy if one is interested in cooking. The secret of good, tasty cooking is the right proportion of ingredients that are to be used in cooking. While preparing any dish, a perfectly balanced mix of the various ingredients should be maintained since adding even a little more or less can ruin a perfect dish. Another important aspect is to extract the correct strength of a spice and never overstate it. Timing is also very important. A dish should never be under or over cooked or else it looses its flavours and nutrients. As far as possible good quality condiments and spices should be used. 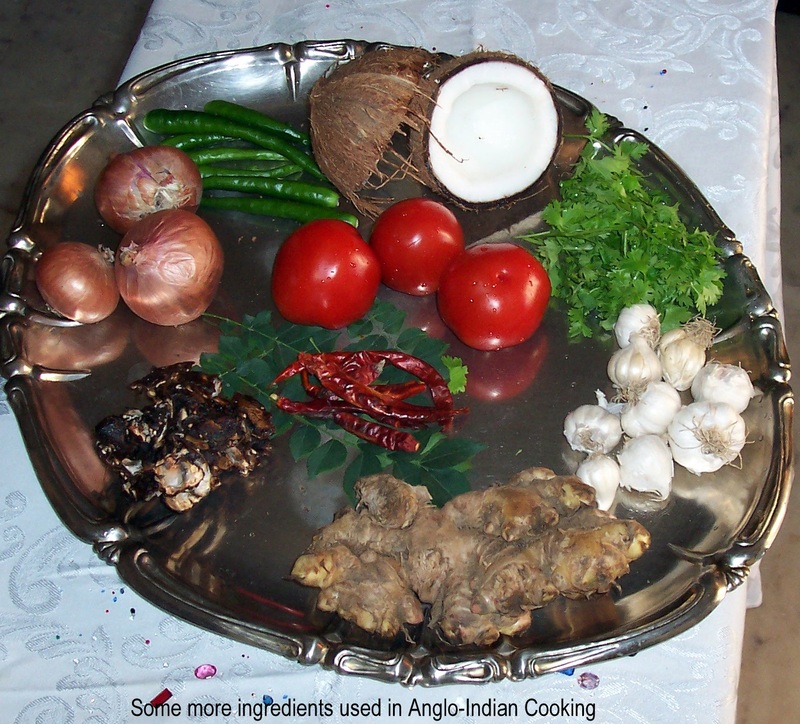 Anglo-Indian Cooking specifically makes use of these commonly available ingredients: namely chillies, cumin, pepper, turmeric, coriander either whole or in powder form and whole spices. In the olden days, cooking would take up practically the whole day since everything had to be prepared from scratch. The masalas had to be ground manually on a grinding stone and the food cooked over firewood. Now with all the ready-made condiment powders available in the market and the modern and time saving gadgets, cooking has become so much easier and faster. However, in order to get the authentic and well remembered taste of Grandma’s Anglo-Indian Curries and Side dishes it is always better to use the right ingredients and follow the recipe scrupulously. 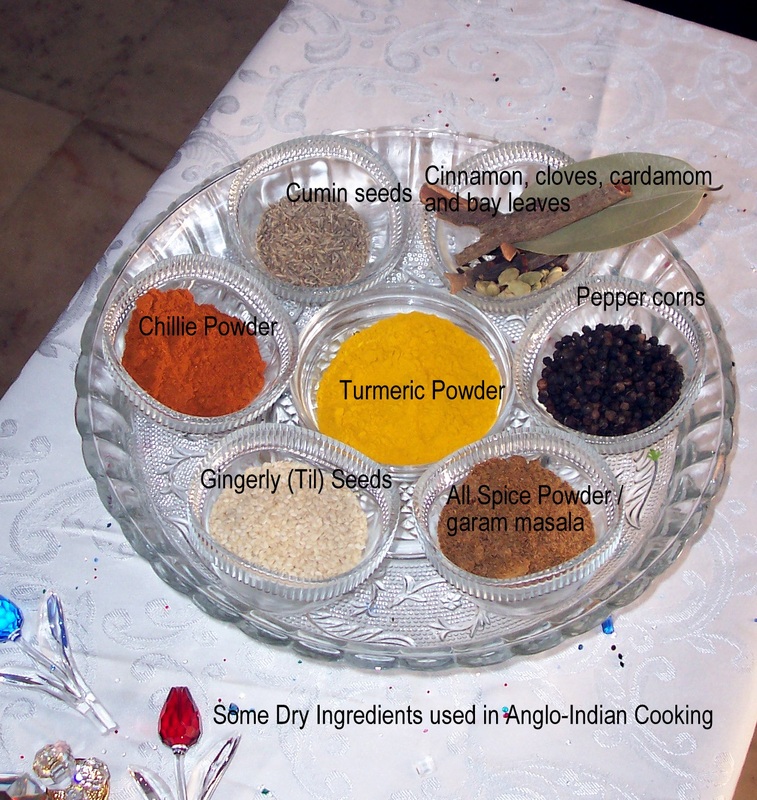 Posted on October 17, 2012 by Bridget White-KumarPosted in Anglo-Indian RecipesTagged Anglo-Indian Recipes, DIY, garam masala, Garlic, Ginger, Ingredients, Onions, pepper, salt, spices. Masalas always tasted better when they were ground on a grinding stone which was an essential part of every kitchen in the more leisurely days in the years gone by. The masalas now available in packets cannot match the taste of the original spices ground on the old grinding stone. Another factor which greatly contributed to the taste of prepared food was the way it was cooked on coal fires. Even today, food cooked on coal fires tastes much better than food cooked on gas stoves.